Seth Eliot's Blog » Blog Archive » Who is the HiPPO? « Better software through SCIENCE! HiPPO driven decision making is the opposite of data-driven decision making. The “highest paid” person may be your boss, or the VP with his eye on the project, or even the CEO. But no matter how many of those big bucks they are pulling down, it turns out that 2/3 of decisions made without the data are the wrong ones. 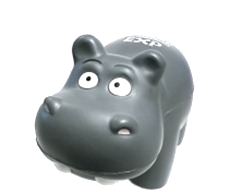 When promoting data-driven decision making at Microsoft we distributed 1000s of these little hippo squeeze toys. Perhaps by squeezing our hippo toy, we are reminded to constrain our HiPPO from making rash decisions without data (somewhat look a voodoo doll). But another, kinder way to look at the HiPPO is as the person who has final responsibility for product feature decisions, and as a reminder to get that person the data they need to make the data-driven decisions. Either way, it reminds us that data trumps intuition. This entry was posted on Thursday, January 8th, 2015 at 7:50 pm	and is filed under Uncategorized. You can follow any responses to this entry through the RSS 2.0 feed. You can leave a response, or trackback from your own site. Was it data that drove the decision to distribute 1000s of hippo squeeze toys or intuition?